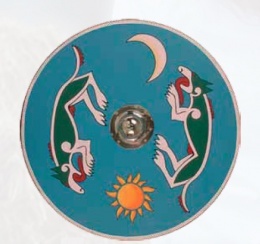 Wooden Viking Shield Blue AH-3993-W Our Wooden Viking Shield in Blue made of Plywood, includes steel shield boss and is hand painted with the mythological Viking wolves Hati and Skoll chasing the sun and moon. When they catch them the final battle of Ragnarok begins. This page was last modified on 13 May 2014, at 18:18.